Hi Janice. Welcome to Café Cala. I’ve been baking a cranberry and cocoanut loaf for us this morning. Would you like tea or coffee with a slice (or two)? Cappuccino skinny for me, thank you. Then I can feel better about eating some extra of your delicious food. 1 Where did you get the idea for All Naked and Bare? I grew up in a coal mining community with a coalminer father. It was a simple, innocent upbringing, filled with love. Although my mother never complained about her life, when I reflected upon it, I realised she had a subservient role compared to women today. As a tribute to my parents, I wanted to write about the times, including some incidents from my own childhood. 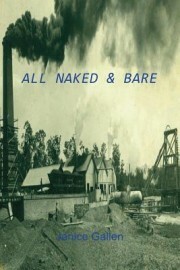 Although the characters in All Naked & Bare are fictional, some of the events actually happened. I love to escape into my characters’ world. As I write about each new person I imagine them, their life, dreams and desires, and I care about every one of them. When someone reads something I’ve written, and shed blood over, and tells me they’ve enjoyed my story, every drop of blood is worth it. My earliest memories of writing involve primary school. I won an inter-school competition in a May Day essay contest writing about the effect of unions. When I held the monetary reward in my hand I realised I could get paid for doing something I really enjoyed. Then, at age 11, I used to correct my schoolmates work for the newsletter and write a cliff-hanger serial. I think it was entitled The Haunted House. That’s a hard one to answer. Without sounding too egotistical (I hope) it’s probably my persistence. Along with that, I find critiquing from my writing group and critique partners invaluable. And always my husband, family and friends assist in any way they can with their encouragement and love. Currently I’m editing a romance, Eve’s Christmas, I wrote way back in 2003. I was thrilled to see Harlequin has a new genre called Cherish, which seems well-suited to my manuscript. I’m also re-writing a few chapters of a cosy mystery, Dark Visions, before finalising the ms and sending it away. 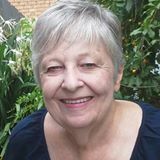 I’d say join an organisation like Romance Writers of Australia; sign up for any workshop you can; decide what you want to write about – something that inspires you; join a fantastic critique group; or failing that, find a critique partner. Most importantly – Don’t give up! Another hard one – I enjoy Harlan Coben and other writers of thrillers; Maeve Binchy delights me with her characters; Michael Connelly can be very clever with his courtroom dramas; the list goes on, including Elizabeth George, John Steinbeck, Louisa May Alcott, Leon Uris. Most of these are past reads. I’m prepared to try most types of books from adventure stories to romance. All Naked and Bare is available to buy in paperback through FeedARead, Amazon, Waterstones, Angus & Roberston, Booktopia, Ebay, Foyle’s Books and many others. The Fifties was a time of family closeness; a time of community support: a simple time. Yet, lurking beneath this laid-back exterior lay the narrow morality and culture affecting many families. Will Polly Carpenter find the courage to take a stand against the restrictive values of a small 1956 coal-mining village? Will she be able to hold her family together when the mines close? Will Polly’s daughter, Kathryn, be able to follow her dream and achieve a profession – definitely not something girls in her hometown would do? Kathryn isn’t concerned; she accepts what life has to offer. Her innocent outlook on boys and religion provides some amusing glimpses of the times. But every day adults live with the threat of pit accidents. Polly puts up with this without complaint, until one by one, her sons move away to find work, and her existence becomes unbearable. In Merthyr Vale women know their place. Many miners are heavy drinkers and cruel, yet there is no escape for the wives and children. Chip Carpenter is never violent, but one afternoon his drinking takes him too far, exposing Kathryn to danger. Thanks Helen especially for reading the book and your constant suppport. I loved your book and I think it has the ring of true authenticity.